Baby Boys have Cute Stuff too! | The House of Martins The House of Martins: Baby Boys have Cute Stuff too! Baby Boys have Cute Stuff too! Its seems like baby boys are every where all of a sudden (and soon to be a handful more.) So I thought I'd share some super cute little boy stuff I've found - because everyone always thinks baby girls get all the fun. An awesome place to check out if you need a gift for a baby boy (or toddler) is Wry Baby. It would take a whole post of its own to list all the cute items on here (who doesn't want a super bad! baby) so I'm going to only show you one. 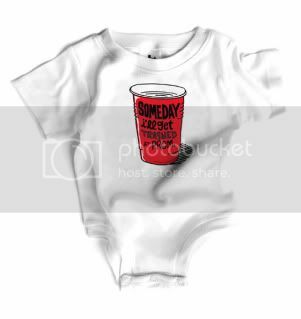 This "Someday I'll get trashed at Prom" snapsuit is great... and is just the kind of stuff you can find over at Wry Baby. Browse the site for the rest but make sure you check out the Monster Hooded Bath Towel. Etsy is of course, another favorite place of mine to find unusual gifts for anyone - so I've found a few great baby boy items there as well. 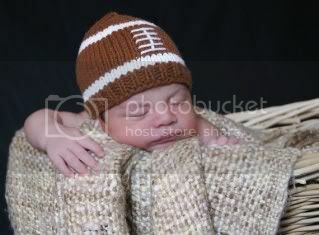 The sports beanies over at For Stitches Sake's shop are adorable. This football version is my fav. Baby Boy Photo Prop needed? 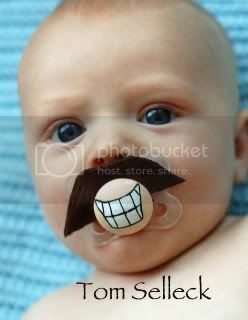 Then you have to check out the Mustache Pacifiers at the etsy shop piquant designs. What a quick way to dress up your little man. And if all these things are too funny / cheesy for your taste - check out Little Sapling Toys. These aren't specifically for boys - but the organic natural wood toys are so clean and simple looking - that I can't imagine better toys for baby boys. 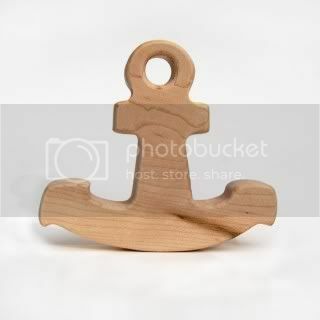 Don't you just love this little teething anchor! And last but not least... don't forget the cute shirts over at wornfree once your little guy gets a little bigger!